This is a special Mantra for getting promotion in your job or employment. Even though, we have written about many Mantras, Yantras and Tone, Totke and Upay for progressing in employment, the Mantra described in this post is a unique and standalone Mantra for getting promotion. 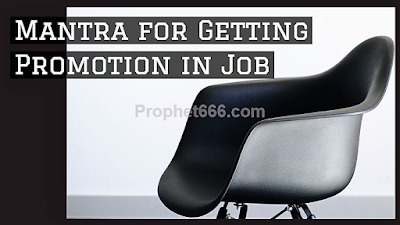 Many of our readers are always looking for simple yet most powerful paranormal solutions to reach the next level in their jobs or feel that they are stagnating in career and wish to get promoted. The Mantra described in this post is a Jain Mantra, which invokes the most powerful Jain Deity Ghantakarni who has been described in many earlier articles in various Mantra Experiments of all kinds that are practiced by invoking her. There is no special Vidhi prescribed for this Mantra Prayog except that it has to be chanted for 1 Mala or 108 times daily until the practitioner get the promotion desired by him. A Rudraksha or any other counting rosary can be used for this Mantra. Notes- Ladies practicing this Mantra Prayog should avoid chanting the Mantra during their Monthly Cycle. The information about this Mantra for getting promotion has been posted in good faith for those readers who are seeking supernatural means to move ahead in their employment, however, we cannot guarantee anything. Many more paranormal solutions, including Mantras,Yantras, Prayers and Remedies for job and employment related issues and problems can be seen in the various sections of this site. Sorry as my query is not related to this post. Last night I dreamt that me , my mother and father went to a temple to get Darshan of Shani dev. And we were standing in line. I don’t know why we got Prasad before hand , we got mustard seeds and sesame seeds . I ate the mustard seeds part and gave sesame seeds part to my parents. There were lots of obstacles to get his Darshan like the temple was very crowded and we were standing in queue for hours. But before we could get Darshan I opened my eyes and it was around 4:30am early morning. I have never dreamt of him before and Iam very much worried . Are there any remedies to perform like lighting Diya infront of lord shive etc..
Kindly do not do anything, just say a small prayer to Shani Dev to bless you. It probably has something to do with the taste of mustard and sesame seeds, which might be somewhere in your deeper memory that has come to the fore during sleep because during pregnancy such smell sensations can be experienced. Sir , thank you for the reply. It really means a lot . Sir is it a good or bad dream. ?What does the dream represent ? And any remedies u can suggest.